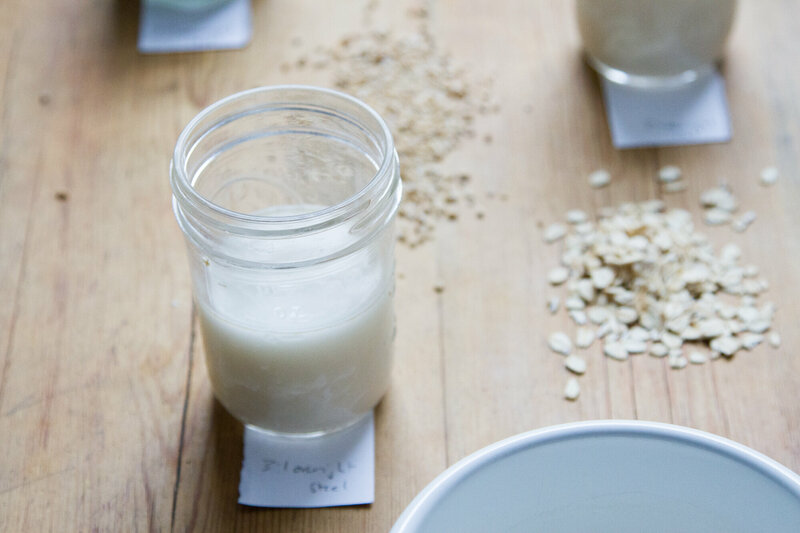 make your own: oat milk. – Reading My Tea Leaves – Slow, simple, sustainable living. I’ve been drinking oat milk lattes on days when I find myself working from coffee shops, which is a shorter way of saying my expensive coffee habit has become more so and I’m feeling late to a party that I didn’t know existed. After listening to beleaguered baristas in one neighborhood café pass their morning telling hopeful customers that no, alas, they do not have oat milk, I found myself, quite by accident, in the neighborhood café that does serve oat milk. Curious, I placed my order. Delighted, I drank my whole cup. Since then, I’ve become one of the same eager oat milk enthusiasts perkily inquiring after the milk alternative that doesn’t taste like a bummer. Despite my relative innocence on the subject, oat milk isn’t actually new. Bon Appetit covered the “milk ready to dethrone almond milk” more than two years ago and cited Stockholm coffee shops as starting the trend. In conducting my own lay person’s research, I’ve found that most coffee shops carry the Swedish oat milk brand, Oatly. I couldn’t pass on the opportunity for a good kitchen experiment and so I endeavored to make my own. Oats, I figured are delicious, full of vitamins and nutrients that, to borrow a phrase, do a body good, and perhaps most intriguingly, they’re extremely inexpensive. A jar of hazelnut milk in the fridge is a lovely thing to have, but it’s rich in more ways than one. In my quest to recreate that perfect coffee shop foam, I made milk from rolled oats and milk from steel cut oats. I used a ratio of 2:1 water to oats and 3:1 water to oats. I let some oats soak overnight and blended others straight away. I strained using a nut bag and I strained using thicker cotton cloth. I had tiny jars of differing blends littering my kitchen and providing endless interest to my small children. Still, poured into a morning smoothie, substituted for cow’s milk in a batch of muffins, gulped enthusiastically by kids eager to try something new, the milk was nevertheless a hit. For now I’ll leave the lattes to the experts, but I’m not giving up on oat milk altogether. In case you’d like to try a batch of your own, I thought I’d share the recipe I like the best. + Combine oats, water, salt, and sugar and soak for several hours or overnight, until the oats have plumped a bit. What about you guys? Oat milk enthusiasts out there? Anyone with better luck at getting the fluff? 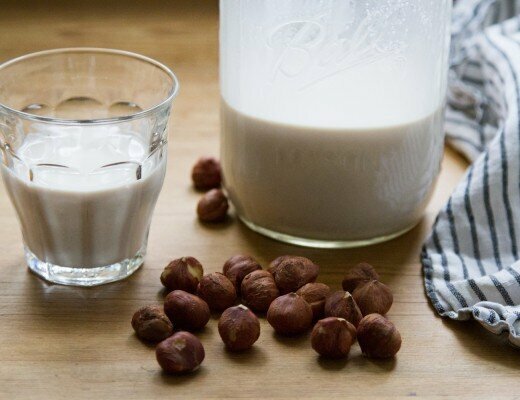 make your own: hazelnut milk. 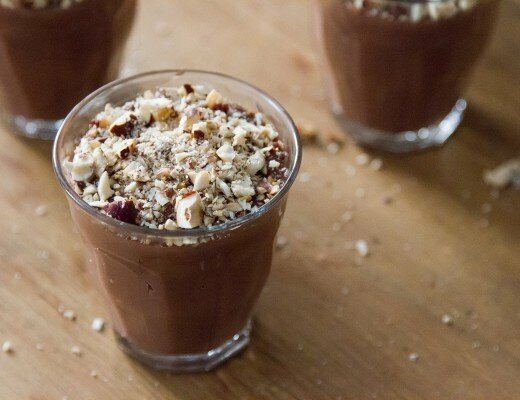 make your own: chocolate pudding. I have been considering giving up dairy but the rub (ok – one of the rubs) is I love milk in my coffee. I’ve tried and failed to like any nut milks in there and got very excited when I heard of this oat milk alternative. I will definitely be giving this a try. I also love that I could just make oatmeal out of the leftovers. Thanks again for being the scientist here! I read this with a smile! Oat milk is so creamy and not overpowering in coffee. It’s my go-to. I can also recommend coconut milk (it’s like holiday in a cup)! Wouldn’t have thought of the steel cut oats trick! Thanks for sharing. I find it funny that this is suddenly a trend, too–I thought there was oat milk in the 90s! We went to this lovely cafe De Maria (have you been?!) and the waitress shared that oat milk’s popularity is in part because almonds are so water-intensive in comparison–so fascinating! Oh, I’m sure there was! Yes, love De Maria! And yes! I found the steel cut oats produced a milk that was a little less viscous but still creamy! Thank you! I recently tried oat milk as the freebie from our local grocery delivery and love it—but balked at the cost. I was eventually going to look for a recipe, and here it is! I am so happy to try this. It is delicious in coffee, tea and on, well, oatmeal! The fact that I can then use the oats as my morning oatmeal is awesome too. Oh man, I know the sadness that comes from trying to warm oat milk and getting…oatmeal. So gloppy and gross! So curious what the oat milk makers are doing to get it to foam and fluff instead of glop! yes! wonder if that helps with the gloopiness! as for the foam, it’s the acidity regulator they add to the their barista blend! glad to know that at least i’m not just a deficient frother! I buy oat milk from pacific foods (not sure if they sell on the east coast?). I notice they have something call gellan gum in it. I”m guessing that’s what keeps it from glopping. Not sure what makes it frothy (as in what the oatley recipe is…) but most coffee shops use special barista blend Oatley, which is different than their traditional blend. I’m guessing it has some additive?? Neat! I just had my first oat milk latte the other day too and was pleasantly surprised! I have no idea how they get it to fluff so well, maybe just their high powered steamers? I love how much more practical/sustainable oat milk seems than nut milk. Cheaper, potentially more local and so easy to use the after products! Thanks for sharing! LOL, I kept reading the headline as ‘Goat Milk’! Hi! 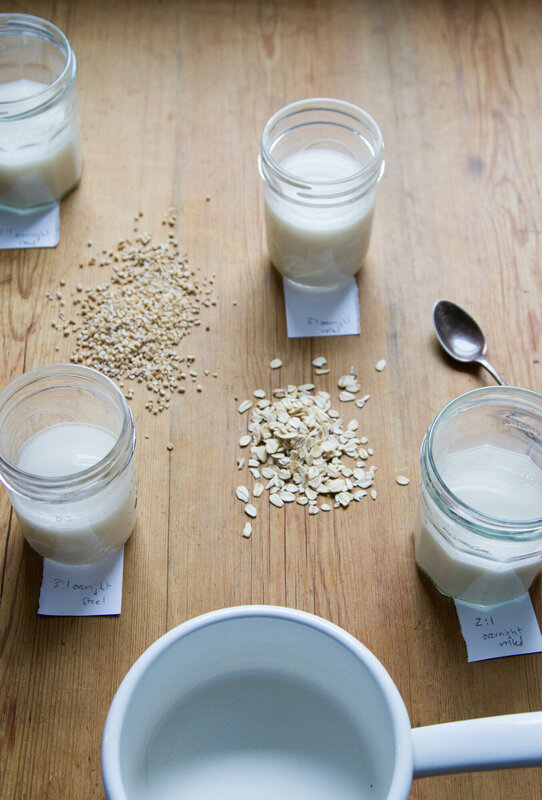 Have you tried making hemp milk yet? 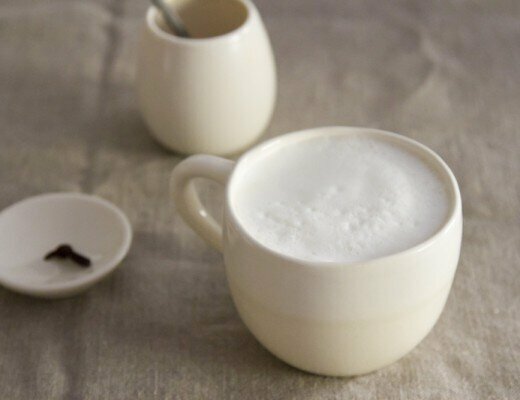 It is my homemade go to for milk and awesome for hot chocolates. The almond milk is a luxury and the oat milk always gets goopy. Hemp milk to the rescue! Unsweetened it is a bit “grassy” tasting but still great for cooking. Add a few dates and it’s delicious! It is best used within 2-3 days of making but it gets foamy and is affordable and easy to make. I don’t strain mine. I like to make a date sweetened batch ready to be made into hot chocolate with just the addition of cacao and a little vanilla. My recipe is 1/4c hemp hearts, 3-4 cups of water, 4-6 dates. Blend for 3-4 minutes. I have the same oster blender and it works well for it. Try it and see what you think! I am so happy to have it in my repertoire. 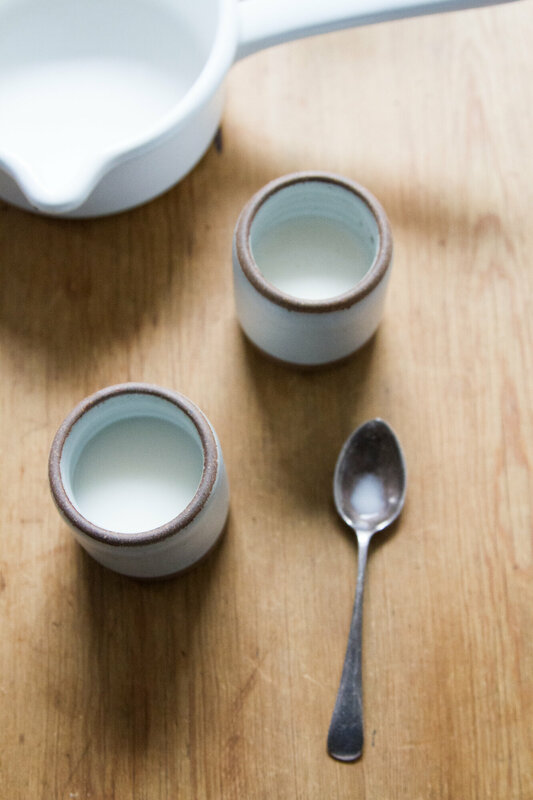 Vanilla hemp milk is our milk-allergic girl’s favorite, and her brother loves it too. We should have stock in Pacific, we buy so much…love the adding of adding dates to the homemade version, and we’ll definitely try it! Do you soak the hemp hearts? I love hemp milk! Ha, yes, very familiar with the home-frothed milk. Homemade oat milk doesn’t froth much even with a frother, but I think another commenter sleuthed the reason for the stuff in coffee shops getting so foamy…less about those high-powered machines and more about the addition of an acidity regulator. Link in the comments above! 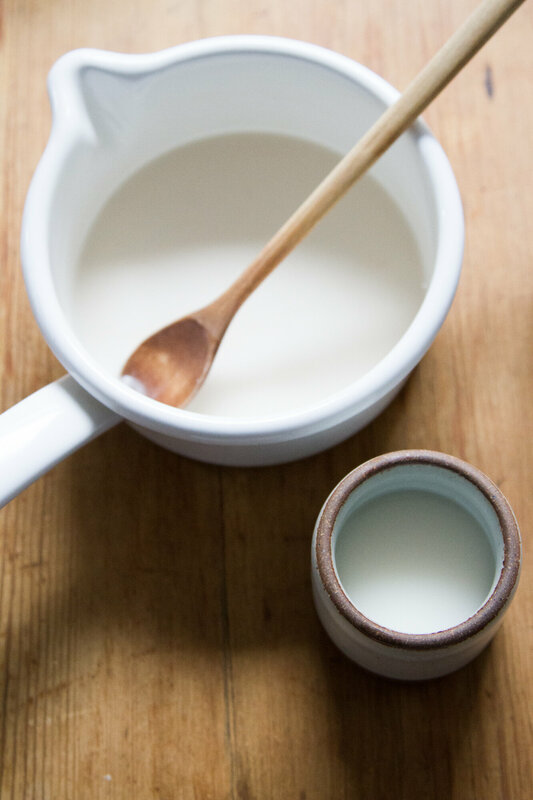 I started making my own oatmilk a few weeks ago, and here is what I do to avoid the gloppy thing when heated : i reduce the amount of oat… My current recipe is 50g of oat for 1 liter of water, plus a teaspoon of honey and a pinch of salt. It still thickens a bit, but does not become gloppy at all. Ah, interesting. I found even a smaller concentration of oats to still result in the gloopiness, but it was much improved with the steel cut oats! I tried oat milk for the first time at Boba Guys and loved it immediately. It looks like Oatly now sells to the US thru their website? Also I’ve seen Pacific brand online for about half the price from Jet and Target. I don’t have any tips on making my own tho, and recipes I’ve found online say not to heat it up. On the frothing thing, most baristas here use the special barista type of Oatly which froths really well. We’ve also had success frothing regular organic Oatly at home with a coffee machine – not quite as effective as the barista kind, but still delicious and contains less additives. Aaand if you haven’t tried the chocolate flavoured Oatly, I would highly recommend it if you can find it! It’s full of sugar, but DELICIOUS. Their vanilla custard is also really good (called vanilla sauce though in Sweden, which was quite confusing at first!). Yes! Big oat milk enthusiast here! I think a difference with commercial made oat and nut milks is there are usually some additives to thicken or keep it from separating. I have also found it pretty much impossible to create any froth with oat milk. If gloppiness (sliminess?) is an issue it can help to rinse the oats after an initial soak, and then blend with fresh water. Oats create a sort of slime that can be off putting for some. I love that you experimented with rolled and steel cut. Years ago I always used rolled oats, but recently have been using steel cut instead and I LOVE the leftover pulp in smoothies and yogurt bowls. Yes! I did experiment with some rinsing and fresh waster, but definitely found the biggest difference came from using the steel cut instead of the rolled oats! Only slightly related here … when I add a bit of storebought vanilla oat milk (organic Pacific brand) when making oatmeal on the stove, the pan comes clean, weirdly easily when I’m done. Unlike when I add the same brand of almond milk or cow milk or just water, when I’m left with a pot to scrub. I now make our morning oatmeal with oat milk purely for this reason. I wonder if it’s true with homemade too! 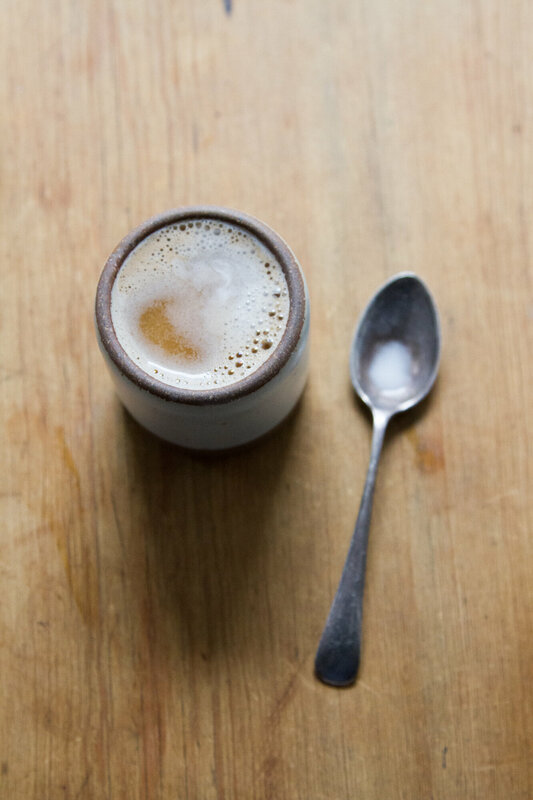 Where have you found your favorite oat milk lattes? Always looking for new coffeeshops to try! Did you rinse the oats after soaking and blend with a new batch of fresh water? I’ve read that the oats need to be rinsed after soaking to help with the gelatinous factor. I think I’m going to try this tonight. Will let you know how it works out! I did rinse! Didn’t find that it was effective as using the steel cut oats instead of the rolled oats! Curious to know how it works for you! Great recipe! I usually make milk from cedar nuts by the reverse technology: first grind everything with a blender directly with the shell, then pour hot water, insist, strain and drink. I’ll try your option with crushed oats. I really love my morning oatmeal porridge, and I’m vegan, but just the use of the words *gloppy* *goopy* *gelatinous* to describe oat milk in this post has my stomach doing unpleasant flips. I don’t know if I could ever try it now! Good thing I like almond milk and cashew milk. Am I the only one with weird food issues like this? I discovered Oatly here in Korea and it’s a lifesaver for my dairy and nut allergic one-year-old! I’m looking at those East Fork Pottery mugs and wondering about the toddler size for an almost 4 year old? Thoughts? Erin — East Fork is in my town, their brick & mortar store is actually a couple blocks from my house — and I would suggest maybe looking at their new 8 oz tumbler size instead of the toddler cup. I have a 4-year-old and the toddler cup was just a tad small for what she normally drinks. I figured that we’d get more use out of the 8-ounce tumblers in the long run. I can definitely attest to their quality and longevity though! I’ve been collecting and using their pottery for about 5 years now and everything has held up great (and fine for dishwasher). So after reading this post, I decided to ask my local coffee shop if they carry oat milk. Indeed! I quickly ordered an oat milk latte and was floored. SO GOOD! I have been searching for a realistic dairy alternative for my daily-espresso habit for years and nothing quite fit the bill until I tried oat milk. Now we are using it in everything and I’m officially dairy-free! I’m so happy to have found your page and then come across this post. I LOVE oat milk, but the coffee shop (which is amazing) by my house doesn’t have it. So glad to found an alternative to lactose-free and soy milk that I can actually make.